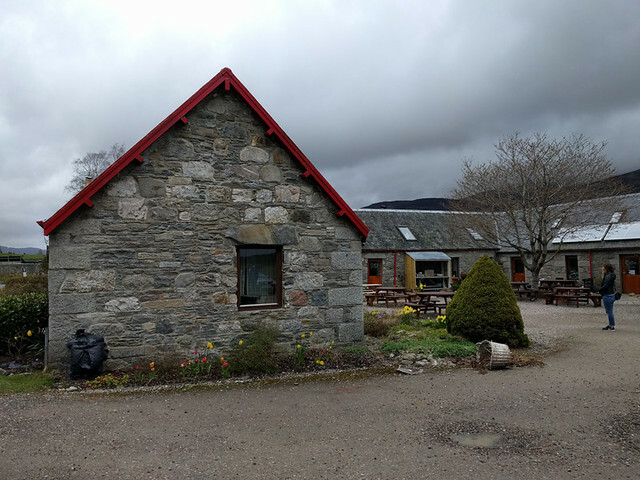 On our way to the Tomintoul Distillery tour, we grabbed some caffeine at the Caoldair Coffee and Craft Shop. I had a scalding hot latte that took me forever to drink (I finally had to get a to-go cup) while Eric enjoyed his (less-hot) hot chocolate. Tables are interspersed with stuffed toys, postcards, and clothing items and there seemed to be a few locals hanging out. Due to a whiskey event for the boys at 7pm, we made an early reservation at the Copper Dog. We were seated in the middle of the restaurant and the dining area grew steadily busier as the meal progressed. Eric started with a tomato soup that was more like a veggie stew (at least the brown bread was good) but my smoked salmon starter was very tasty. Eric’s second course, a ‘salad’ that was deconstructed into various parts, was a bit disappointing. The whipped goat cheese was good but the round apples and lack of lettuce were underwhelming. Natalie and I had dessert up in the Quaich Bar and my chocolate tart was very good. 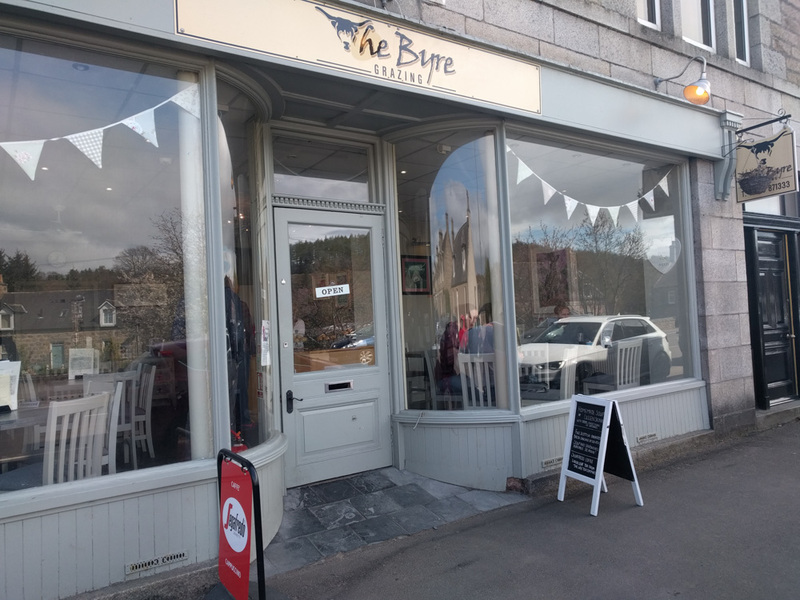 We wandered around town for a bit and then grabbed a quick lunch in Aberlour at The Byre Grazing before our first tasting of the day. 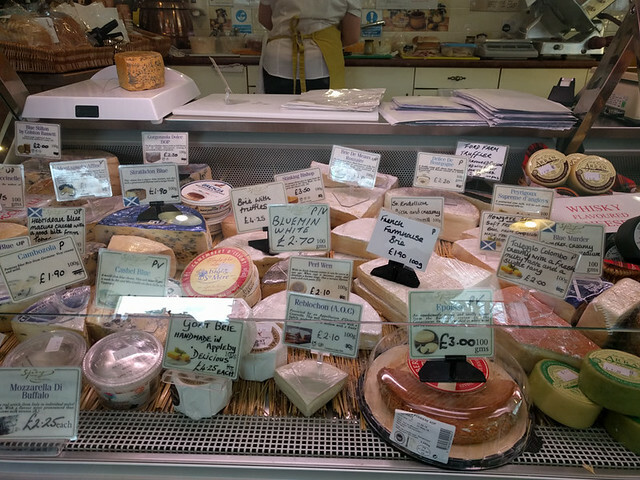 Everyone got sandwiches except for me – I had my second cullen skink of the trip. This version was the fishiest of the lot but the cheese scone was super tasty. 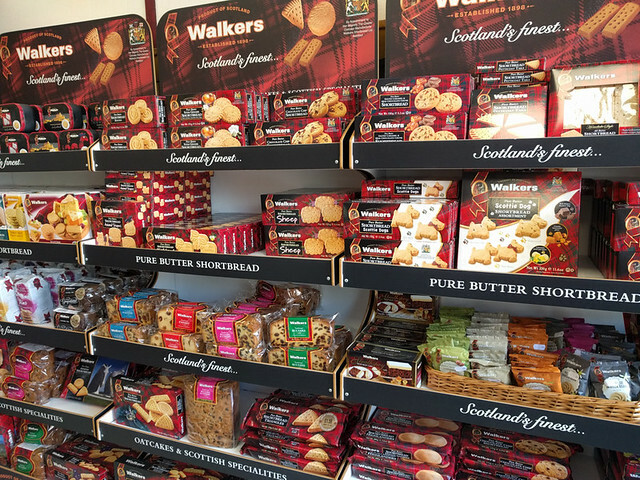 We finally made it to the Walker Shortbread factory store! 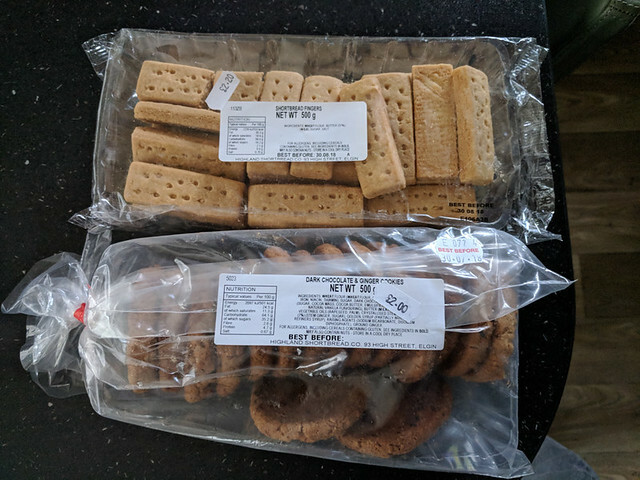 There are many nicely packaged items for sale but PRO TIP: you can get a KILO of shortbread for about £4 if you grab the plainly packaged cookies. Score! 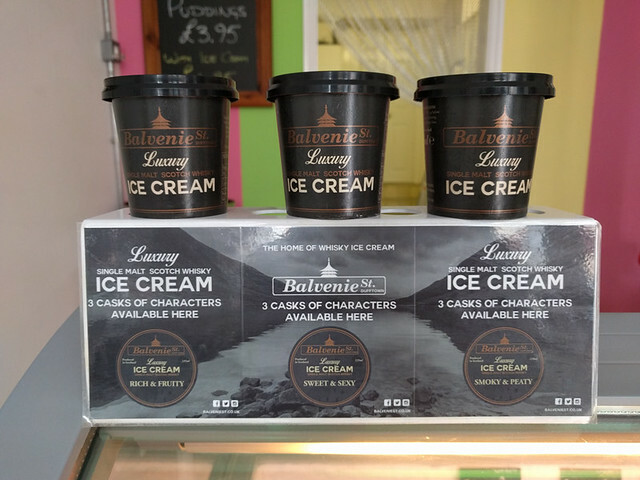 After the Boutique-y Whiskey Co tasting, the guys went to the Whiskey Shop and Natalie and I stopped into the Balvenie St. Ice Cream for a scoop of the “Rich & Fruity” flavor. A bit pricey (£3) but with obvious whisky flavor. The Highlander Inn across the street from our apartment was not taking dinner reservations during the festival, so we decided on a snacky dinner with items from the Spey Larder in Aberlour and the Co-op Food in Dufftown. 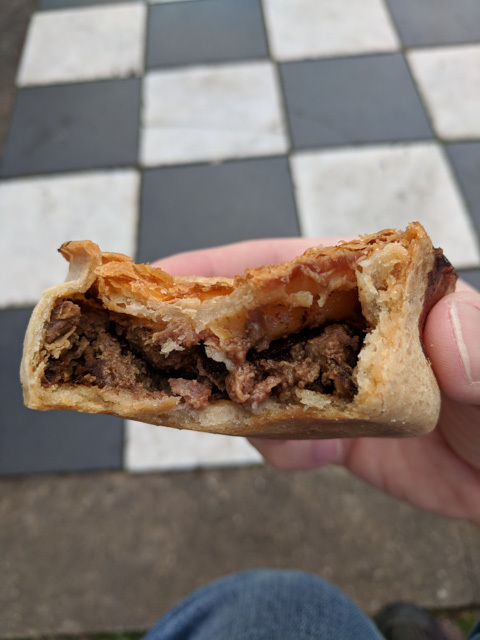 We dropped off Mike and Natalie at the airport for their noon flight home and stopped in Forres for a quick breakfast of a steak roll and meat pie from Maclean’s Highland Bakery. Our first tour of the day at Benriach also included some snacks, so we were able to skip a formal lunch. Then, after the dram under the bridge, we met up with Eric’s co-worker Josh and his wife Susie for dinner at Restaurant 57 in the Dowans Hotel. We arrived early and relaxed in the MBar for a half hour before our order was taken and we were shown to the dining area. My mussels appetizer was delicious but huge for a starter so I immediately regretted my decision to also try the haggis pizza. Thankfully the waitress asked if I needed a box and I was able to take home half for leftovers the following day! The waitstaff was friendly and helpful but parking in the tiny lot can be a bit of a challenge. 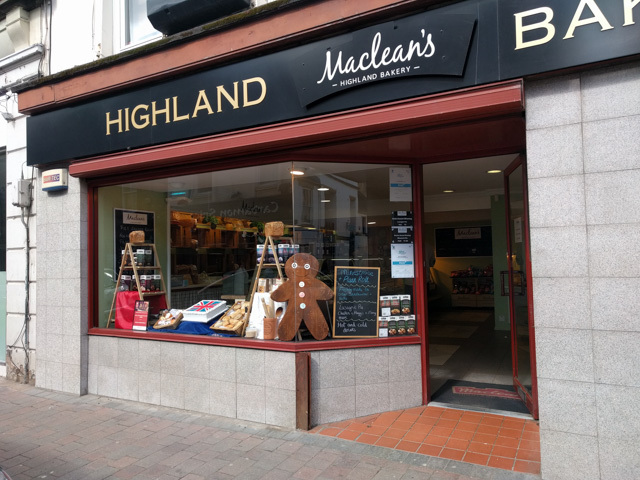 We had enough time after the tours on Sunday to visit the Gordon & MacPhail retail shop in Elgin and explore a bit of the city on foot. 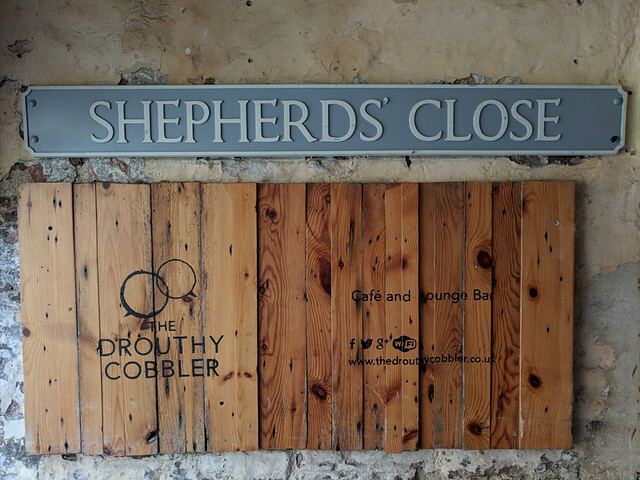 We stopped into the Drouthy Cobbler for a beer and (my third) cullen skink soup of the trip. This version was very tasty and creamy and we enjoyed the relaxed atmosphere of the pub. 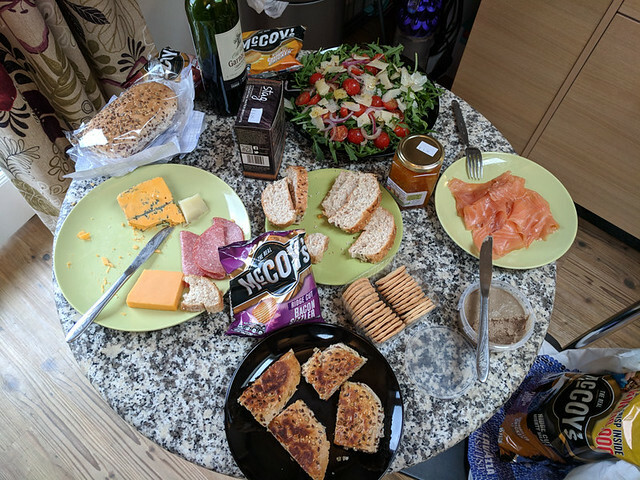 When we spotted an M&S (Marks & Spencer grocery), we decided to take advantage of our full kitchen and grab supplies for dinner that evening. The Chicken Tikka Masala we selected had good flavor but wasn’t nearly spicy enough for us. We also picked up pita bread, marshmallow tea cakes (amazing! ), two types of chips, and some raspberries for breakfast.